Friends of Maungawhau: Get 'em off! Also, why do you call the car in the crater idiocy? I'm sure this was an unintentional accident. I understand that the driver had stopped to help another car, hardly reason for you call him an idiot. Smash-and-grab robberies are common on the summit. We've seen them happen and victims have contacted us for help. Unsuspecting tourists don't think to take all their valuables with them when they hop out to take a photo. 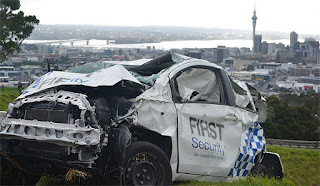 If visitors had to leave their cars at the bottom of the maunga, they'd presumably take more precaution against theft. Certainly there'd still be a risk, but less so. I apologise for the "idiocy" remark. It seems it was an accident, as you say. But let's see what the investigation comes up with. It is such a shame that this has happened. As Kit said in the central leader (4th July) make people walk! If cars were banned from the summit it wouldn't have happened.